More ”forward-dating” of Farthing here, this time to 1947, with some of my ageing RTR stock brought into play. No. 9319 of the 93xx Class serving as station pilot at Farthing. At this point in time Hawksworth is in office at Paddington, but the loco carries the hallmarks of his predecessors Churchward and Collett. This is the Bachmann model with just a bit of light weathering. 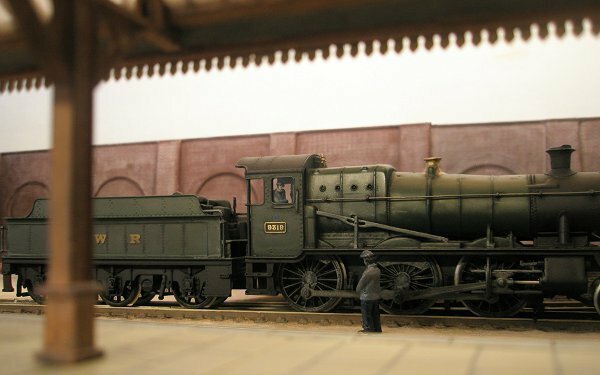 Not too sure about the chimney and other details, but I do like the GWR 2-6-0s. No. 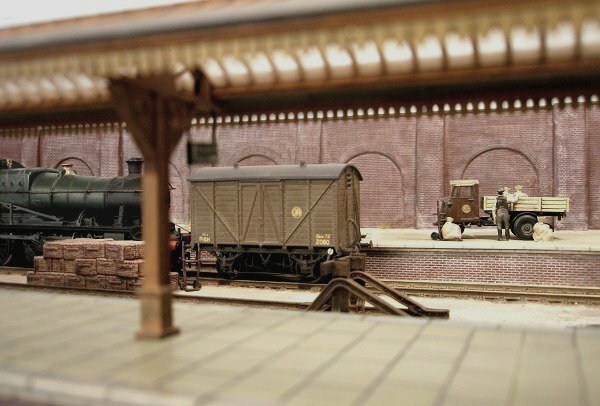 9319 shunts a fish van to Diagram S2 in the sidings. Given the “Shirtbutton” monogram, you’d be forgiven for thinking this was the 1930s, but the “Fish” code on the van wasn’t applied until 1943. I haven't fitted S&W couplings to this "out of period" stock, but simply run it with screw/3-link couplings and an uncoupling hook. The “mechanical horse” is a weathered Hornby item. The S2 Fish Vans were originally Diagram V13, and went through a number of changes of the bracing, louvres and vents. 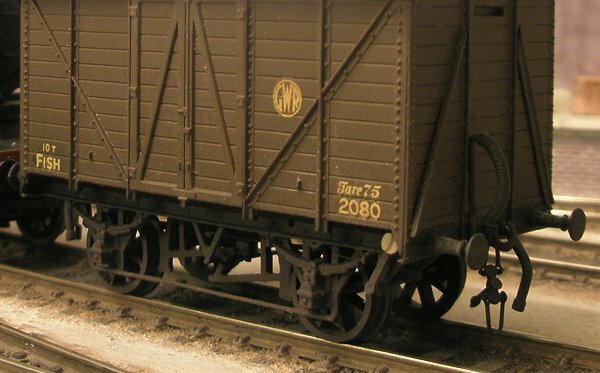 This model shows an example in latter-day condition, based on the photo on page 344 of "GWR Goods Wagons" (Atkins, Beard & Tourret). 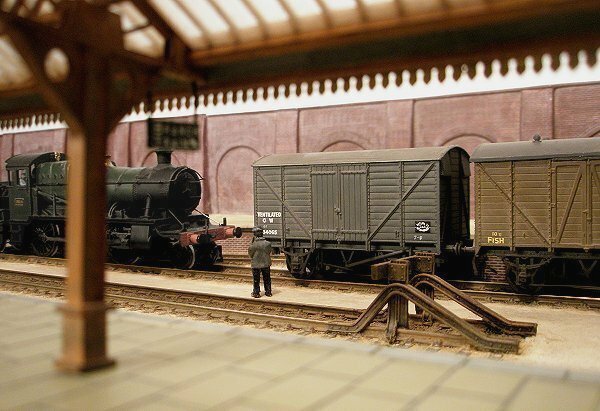 The model was built by Richard Spratt from a converted Coopercraft Mink kit, and I bought it off him for a (now abandoned) collection of GWR browns. A few general notes on converting the Coopercraft kits can be found here. Since taking this photo last week I have applied some light weathering (as seen in the other photos), but am uncertain whether it needs more. No. 9319 introduces a Vent Van on the scene, with the post-1936 small 5 inch letters. This is a Bachmann article straight from the back of my drawer, with just a bit of weathering powder and some 3-links. I believe it is based on the unfitted Diagram V24. The underframe is below even my standards, and if I’m serious about these occasional changes of period I had better get some kits going! Driver J. Drover is no bundle of joy today. Quite apart from his piles, he is rather disgruntled with all these compromises: Here he is, a qualified Top Link man, relegated to knocking about some lowly wagons in a siding that hasn’t been upgraded since 1907. 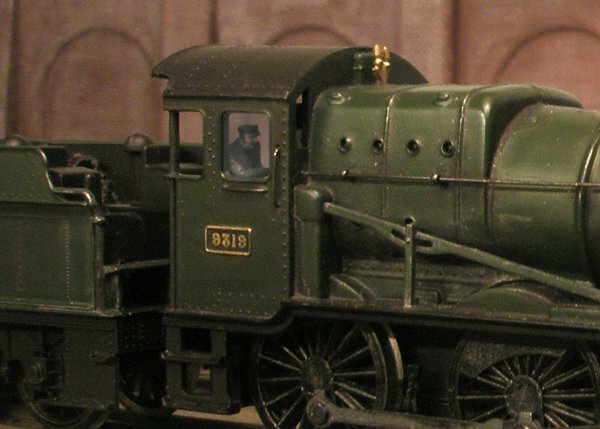 Also, why is all the detail in the cab so chunky, why are there no lamps on his loco, and what is an unfitted Vent Van doing in the company of a fitted Fish Van? Come to think of it, he doesn't even like fish.